Have you seen any strange tracks when out in winter in the Scottish hills? Highly popular in the Alps, more and more people are trying out snowshoes as a way of exploring Scotland’s mountains under a snowy blanket. 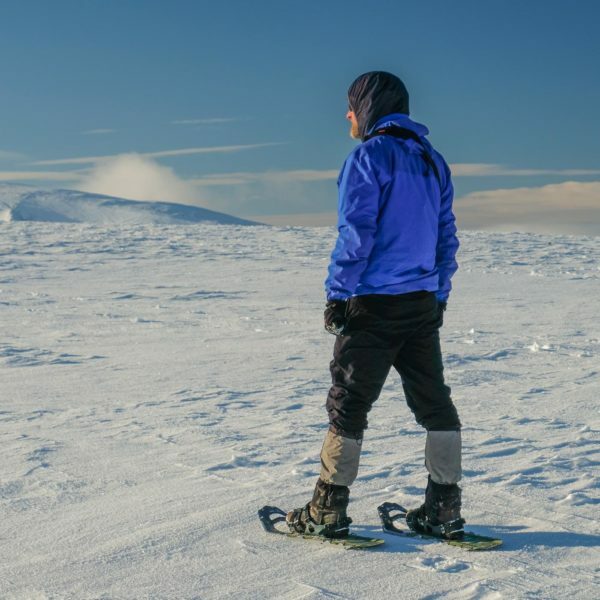 I live in the Cairngorms National Park and have become a big fan over the last 5 or 6 winters – so I was very keen to try out the MSR Revo Ascent, which promise a very durable design including a steel crampon. If you thought snowshoes looked like tennis rackets, think again. Designs have advanced greatly over the years. These feature a relatively narrow but long design, made of hard plastic and steel. 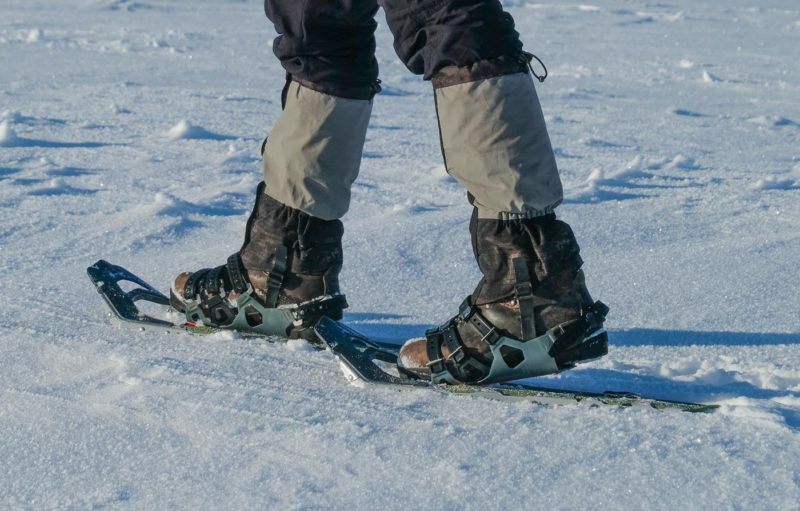 The base of the snowshoe sits parallel to the snow and its large surface area obviously distributes your weight to prevent you sinking so far into the snow, but the foot is articulated so that the heel lifts as you walk. The MSR Revo Ascents feature a fairly aggressive front crampon that digs into the slope as your foot is angled. There’s also a long serrated edge down both sides of each shoe for additional grip. The crampons are steel to give maximum durability; some snowshoes feature aluminium crampons which may be lighter, but I wouldn’t recommend using these in Scotland where there are often rocks projecting from the snow. If tackling a longer ascent there is a heel bar you can snap up under the back of your boot to keep your feet more horizontal. As such they sit in the middle of MSR’s ‘Ascent’ range of mountain snowshoes – with a more aggressive crampon than the Evo, but no fixed rear crampon to aid descends as is found on the top of the range Lightning ascent. They are available in two sizes – 25″ and 22″ – though the size to choose depends on your weight and not your boot size (both lengths should fit most boots). The shorter 22″ version is only recommended for those weighing less than 80kg. 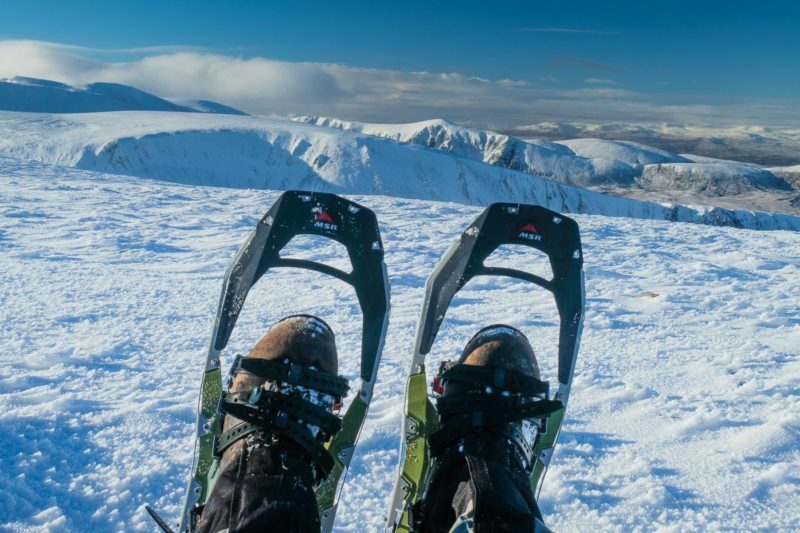 Conditions for snowshoeing have been notably rare so far this year and this review has been delayed until I’ve had a proper chance to test them – but I’ve found the Revo’s to grip superbly. I wouldn’t wear them on the steepest slopes where traditional full crampons would still be necessary, but then my personal winter activities are usually on more moderate gradients of the rounded mountains of the eastern Highlands. As for the bindings, there are no less than three straps at the front and one around the heel. They are very easy to use – even wearing gloves it is possible to secure them tightly through a metal hook and then tuck away the loose end of the rubber strap. The fact that there are three front straps gives you reassurance that even if one comes undone for some reason, the shoe will remain firmly in place. If you’ve never worn snowshoes before, don’t expect them to keep you atop the softest, fresh powder – they won’t (though they are still a great help in such conditions which can otherwise be almost impossible). 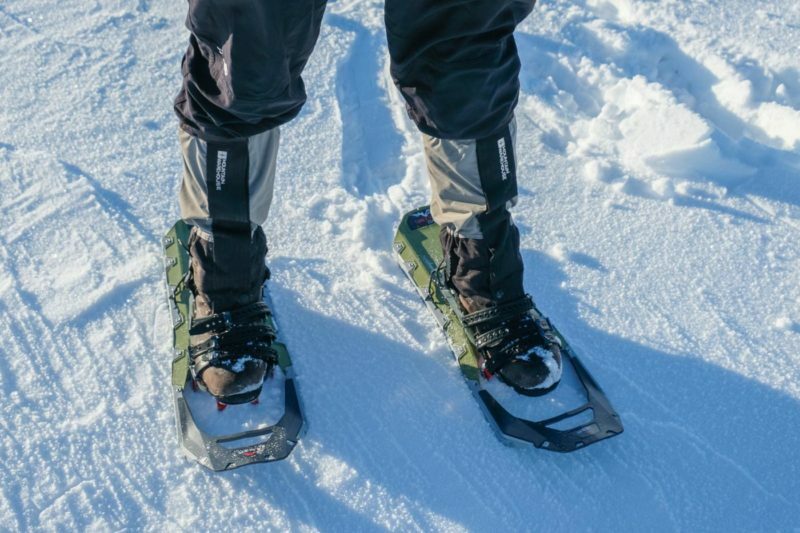 On the other hand, when the snow has a crust that you would break through every second or third step without them, snowshoes make a huge difference and keep you on the surface for much faster and easier travel – no more tiring post-holing up to your knees. Snowshoes for Scotland? If you spend much time in the Cairngorms, the Monadhliath or the Angus Glens in the winter then I think they are well worth the investment. In the right conditions a good day out on the snowshoes is simply something I wouldn’t want to miss.